How DO You Succeed When You've Had a Rough Past? Have you had a rough past and don't know if there's any hope for a bright future for you? You've been through a lot and I can appreciate that more than you know. I for one have had a rough past as well and I've just come to the solid conclusion that what is no longer serving me has to go. I've completely embraced my past as the exact process God needed me to go through in order to fulfill my destiny. I've taken all the good I can from it and discarded everything else. Your past doesn't have to haunt you everyday. The only reason it's even still around is because you're holding onto it. Everything I've been through and everything I've done, good and bad, has shaped who I am and because I've embraced it all as a necessary process, I am stronger and of more value to those I serve. I don't regret anything because I know it was all in God's plan for me. His ways are not our ways, His thoughts not our thoughts. In His wisdom, He knew what I needed to fulfill my destiny. Alot of people will say "because of my past I can't do this and I can't do that" but I've chosen to say "because of my past I CAN do this and I CAN do that". Use your past as a strength, instead of a weakness. Your story is a powerful one I'm sure and it's yours. No one else in the world, or who has ever lived in this world, has the exact story you have. It's just as unique as you are and if you embrace it and move forward "because" of it, imagine the impact you will have when you are living your dream. Imagine the story you'll be able to tell. I say, bring it on! The greater the struggle, the greater the victory. A story is only inspiring because there are grave challenges to contrast the victories. 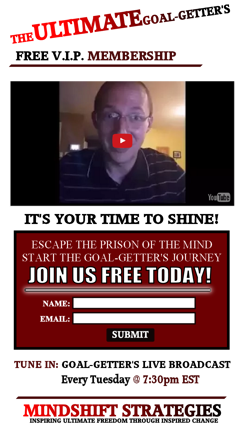 I know for a fact that you have some awesome goals and I want to help you right now to design a plan to achieve them. I've designed a 5 step goal getting system and this is the exact process I go through every single time I have a goal. As I follow these steps, I always get what I want out of life. It's only when I ignore these steps that I suffer living below my potential. Once you go through these five steps, you will quickly realize that nothing you want to accomplish is impossible. With these 5 simple steps, you can have everything you want. Some will come fast and others slow, but you will, over time, have everything you desire in life. When you've been through the 5 steps, please do me a favor and send me a message on Facebook to share with me your experience and any questions you may have. Lastly, don't forget to leave a friendly comment below as a show of support to myself as well as all of your friends that could benefit from this information. Remember to live life with passion, purpose and fulfillment everyday, because life is too short to have it any other way.